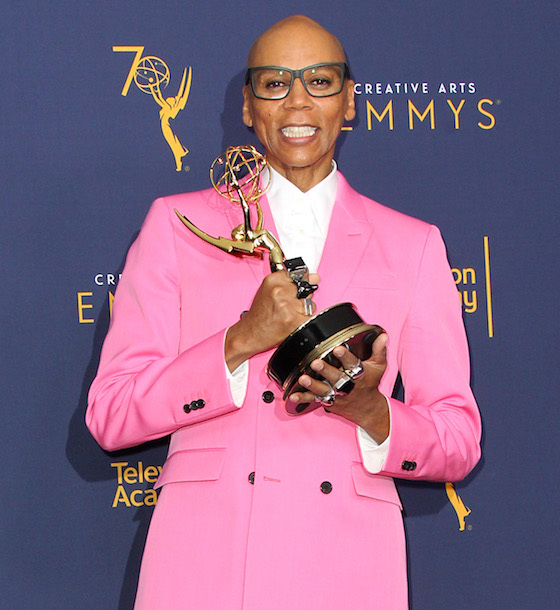 Drag Race won four of the twelve awards they were nominated for yesterday: Outstanding Host, Outstanding Directing, Outstanding Costumes for a Reality Program, and Outstanding Hairstyling for a Multi-Camera Series or Special. That last one went to Hector Pocasangre and Miss Delta Work, who can now say she’s one-half of one of the most legendary lip syncs for your life and an Emmy winner. There’s still one award pending: Outstanding Reality Show Program, but that winner won’t be announced until the Primetime Emmys next week. Back in the press room, Ru posed with his third Emmy, telling reporters: “36-24-36 – and yes, they are real!“. Ru also gave a master class in positive thinking backstage when asked if the optimistic mood of the show effects today’s bummer of a political climate. I can appreciate joy and positive vibes, but I also hope Ru doesn’t ever overdose on it. I’d hate to see a reading challenge in which everyone exits the library and just compliments each other’s padding. Click here to see all the Creative Arts Emmy winners.